One of the latest American Made Woven Wrap lines to throw their hat in the ring, is Atlanta based Lalu Wovens. A mom owned and operated business who sources their yarn domestically and finishes their products locally…. I was already sold on these guys before the tester even made it through my door. They launched their first collection earlier this year (Spring 2015), and I have been impressed by the both modern and elegant prints that they have released thus far. The color stories have been right up my alley too. 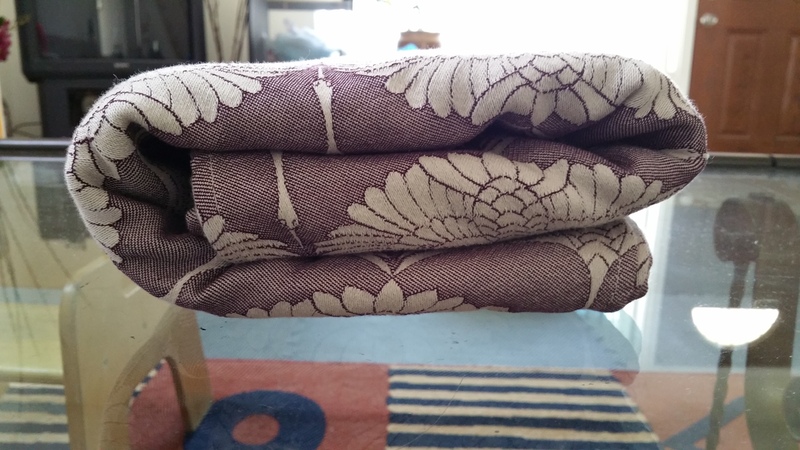 When this Lalu Wovens Demoiselle Black Currant arrived at my house, it was quite an exciting package to receive. The out-of-box experience was truly rich, wonderful presentation to accompany such a lovely woven wrap. My Dragon Baby ooohhd and aaahhd along with me for a moment before we unfolded it. At first impression, it was a dead ringer for something from the Pavo Form line. It had that shiny, textured finish a la Gotham or Plume. It was really stiff. I threw it into the wash, tumbled on a no heat setting, then line dried to finish. It came out immediately softer, and the texture was even more pronounced after the wash. It was a pretty thick wrap, weighing in at 292 g/m2. I could not wait to try it out! The Dragon Baby was a willing participant. I threw my 30 lb toddler up in a pretty sloppy Double Hammock. The wrap is very textured, which made it really grippy to wrap with. I’ll be honest, the passes didn’t exactly glide across her back. This wrap took a little bit of work to get in place. But once it was there, it stayed there. There was none of the tighten – then slip, tighten – then slip drama that often comes with some of those more slippery wraps. Once we were settled in, I started to do some chores around the house. About 10 minutes had gone by, and I started to feel Dragon Baby flopping around a bit. I looked in the mirror, and found her passed out asleep on my back. Whoah. Looks like Demoiselle came with tons of sleepy dust. I let her sleep there another 30 minutes so I could really get a feel for the wrap. 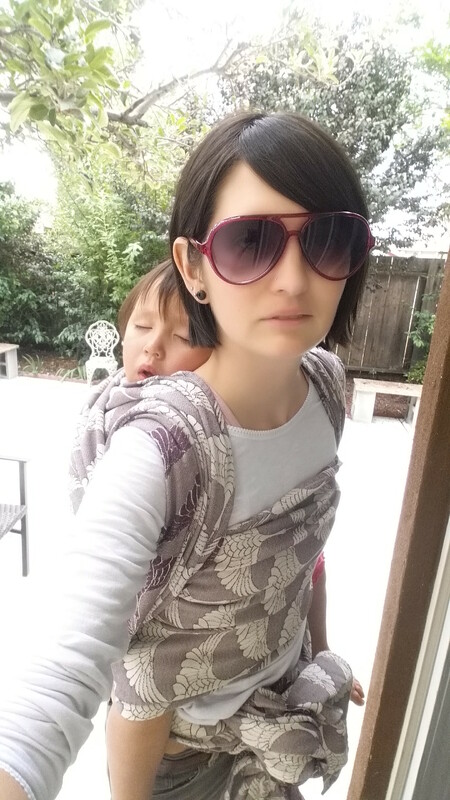 I appreciated that there was no slack in the carry even after almost an hour of wearing her. 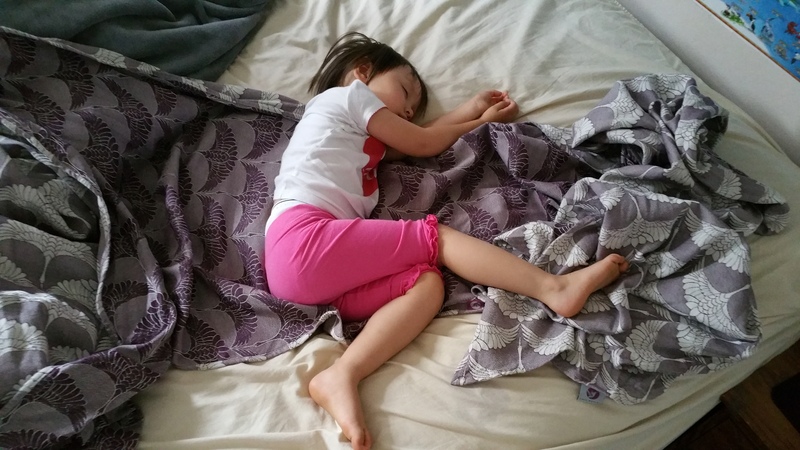 It remained comfortable for as long as I was wearing it, and it passed the toddler worthy test when I woke up the next day and was not feeling any soreness from the previous days wrap nap. Black Currant in a Double Hammock with a Freshwater finish, wrong side out. A few days later, we gave Demoiselle another go. I put the Dragon Baby up in a Double Hammock with a Freshwater Finish, and walked a few miles around the block and back to settle her down before bedtime. Fancy finishes can be a little harder to pull off with these textured, grippy wraps – but it looked lovely in the end and was quite comfortable for the duration of our walk. I have been using it a few days now, and I have to say… it is breaking in really nicely. I have not put much work into breaking it in (other than the work of carrying a 30 lb child, hahaha) but it is getting there quickly. 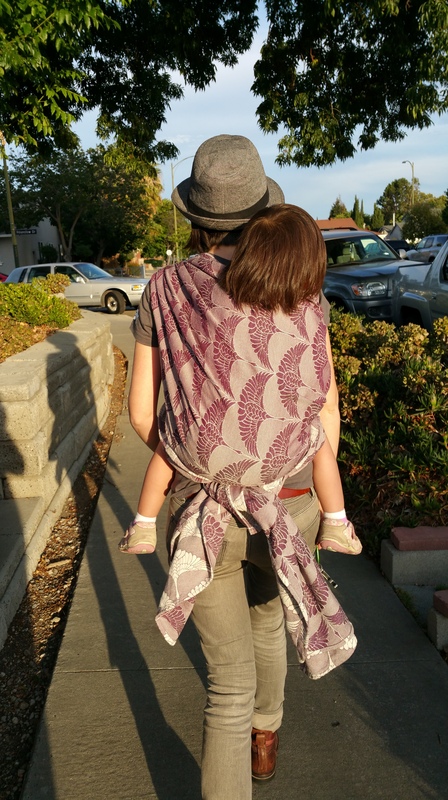 Because of the wide width (73 cm) and the grip, this wrap is a great pick for toddler worthiness. It would not be my first choice for a newborn, or a first time wrapper… I think that it would be difficult to learn on. For those who have been at it for a while though, these are some really great pieces to add to any collection. Demoiselle Tied Under Bum, wrapped wrong-side out. I love the level of sophistication they are entering into the industry with, following in the footsteps of some of my favorite woven wrap lines. Demoiselle’s are retailing just shy of $200 for a Size 6, fitting comfortably into that mid-range category of wrap – but the design aesthetic and the effort they put forth in their packaging really makes you feel like what you are receiving is high end. They donate a portion of all their profits to Lift Me Up Baby for every wrap they sell, so if the classy, modern designs alone aren’t enough to make you want to spend a little more cash…. their support of local industries and their philanthropic spirit should help to sway you in the direction of this wonderful line. 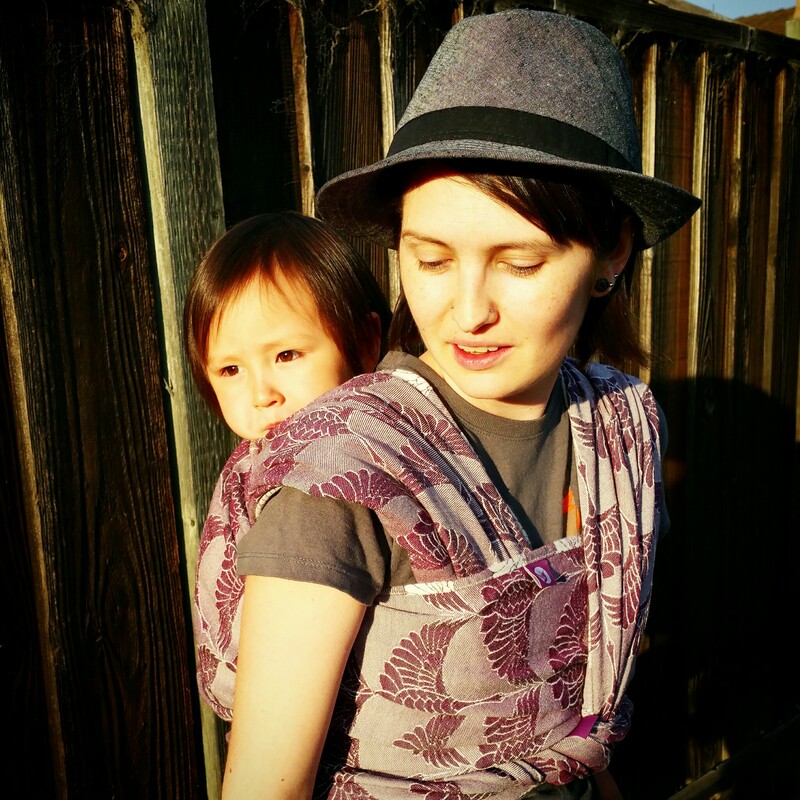 They really embrace that need for a new parent to have something to wear their baby in that makes them feel beautiful, which is such a large part of my personal babywearing philosophy. I can’t help but appreciate their take on it. I am super excited to see what else these guys have coming down the pipeline. They are definitely a brand to watch! Next So You Want to Buy A Woven?